660 on Latest Manhattan Prep Mock, Will Actual Be Higher? As you can see, all of my exams were taken using the Manhattan CATs. I understand that many people feel that the Manhattan CATs are harder than the actual and notice a score increase when they take the GMATPrep's exams or the actual exam. My target score is a 720+, so I'm debating whether or not to sign up for the actual exam to be taken in October or November based on the above results. My original target test time is December or January of next year. Since I'm improving a lot, I'm considering moving taking it earlier and getting it over with so I can enjoy the holidays . I will be taking the GMATPrep exams as well in later weeks, but basically I wanted to get some anecdotal notes of how people felt their scores changed (or didn't change) from the Manhattan CATs to the GMATPrep CATs to the actual. GMAC has publicly stated that the Official Score that you earn on Test Day is within +/- 30 points of actual ability. Assuming a similar 'swing' in how your CATs function - and that you've been taking these CATs in a realistic way - your 4 CAT score results show that you essentially performed the same each time (about 640 +/- a few points). It's possible that you've gotten 'stuck' at this score level. Since all of these CATs are from the same 3rd-party provider, I suggest that you take one of the Official GMAC CATs next - and make sure to take it in a realistic fashion (take the FULL CAT - with the Essay and IR sections, take it away from your home, at the same time of day as when you'll take the Official GMAT, etc.). Once you have that score, you should report back here and we can discuss how best to proceed. Going from X to Y to Z also (likely) involves improvement along the way (not to mention exam pressure on test day! ), which is going to make any analysis of this type quite complicated. 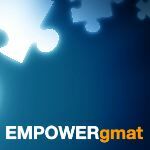 If you're planning to take the exam in October and have access to the exam packs, you can take a GMATPrep now to get a better estimate of your ability level. Also, I just wanted to add that you're doing well on verbal. If you can just get that quant score up, you should be on track for a really good score. Thanks AjiteshArun! The pointers and encouragement are much appreciated. I'll be taking a GMATPrep exam this weekend and will revert back with the results of that one!